The Garden is the most public of the three demonstration gardens in the county, open 24/7 and staffed during market hours. It was named Gallacci Gardens in recognition of the early leadership of Norman Gallacci by the Farmers Market Board. 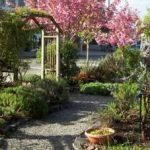 The garden was started in the mid-1990s with plants donated by the market vendors and considerable volunteer effort by Thurston County Master Gardeners. The garden displays have progressed over the years mainly to focus on sustainable gardening practices. A number of theme gardens were added—herb, shade, butterfly, Asian Alpine, an iris walk—as well as composting and trellis areas. The Great Plant Picks program is our guide for plant acquisitions, which we obtain from market vendors and other sources in the region. Overall, the displays showcase a mixture of NW natives and more exotic introductions to the area that bring brilliant color and graceful shape to the garden. Our primary objective is to enable our many visitors to observer, learn, and adopt from the sustainable gardening practices used in this demonstration garden, including water-wise plant use, selective pruning, and integrated pest management. The compost area serves as an on-going educational site for garden and kitchen waste utilization, and the diagnostic clinic provides easy access for those gardeners who have questions or seek advice for problems within their own gardens. Compost workshops are held in the compost demonstration area of the garden and focus on composting in small spaces. Workshops include both yard waste and worm composting. Check our composting workshops page to find the current composting workshop schedule. The Olympia Farmers Market garden is also home to a Master Gardener Plant and Insect Clinic. Please feel free to stop by with questions for our trained Master Gardeners during normal market hours. The garden is open to the public 24/7. The OFM garden is open for the season but the clinic at the market is not while we replace the clinic building.